The impact crater is a dry lake bed that contains evidence of ancient water flows and perhaps signs of ancient microbial life. Mars’s Jezero crater, a 45-kilometer-wide impact basin, will soon be home to NASA’s Mars 2020 rover. A major mission component of Mars 2020 will be to examine whether Jezero crater hosted microbial life in the past. Jezero crater is also a dry lake bed that contains ample evidence of past water flows, including two inlet rivers, an outlet river valley, and fans and deltas. Recent research has also suggested that the Jezero lake once may have overflowed, burst its edges, and caused significant flooding of the surrounding region. 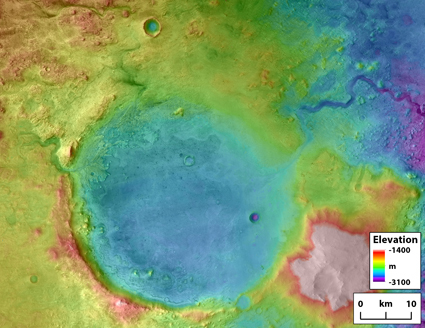 NASA last week announced Jezero as the Mars 2020 landing site. A major mission component of Mars 2020 will be to examine whether Jezero crater hosted microbial life in the past. The basin’s 4-kilometer-wide river delta, seen in the image above, may have trapped and concentrated microbial life flowing into the crater. Mars scientists suspect that the delta’s sediments and clays might now preserve signs of those ancient microbes in addition to sediments from far away that traveled along the now-dry rivers. Jezero crater is located just north of Mars’s equator. NASA selected Jezero after more than 5 years of discussion. During a series of workshops, planetary scientists proposed, debated, and narrowed down possible landing sites for NASA to choose from. The potential sites were judged on geologic and engineering criteria. Scientists considered a site’s compatibility with NASA’s “sky crane” landing method as well as its astrobiological relevance, geologic diversity, water resource potential, and the scientific merit of collecting rock samples. The Mars 2020 rover will be able to characterize weather, dust, and environmental conditions on the planet’s surface as well as drill, collect, and store rock samples that may be returned to Earth aboard a future mission. Mars 2020 will also test whether scientists could produce breathable oxygen from Mars’s atmosphere, a feature that may be useful for future human exploration. Mars 2020 is scheduled to launch from Cape Canaveral Air Force Station in Pensacola, Fla., in the summer of 2020. With more than a year until launch, Mars 2020 mission scientists now plan to finalize the rover’s design and launch details and optimize it to land safely and explore Jezero. Citation: Cartier, K. M. S. (2018), Martian crater will be the landing site for a future rover, Eos, 99, https://doi.org/10.1029/2018EO110957. Published on 30 November 2018.